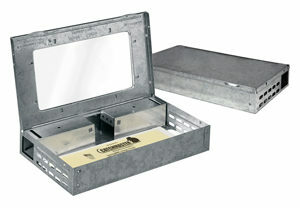 The easy-to-use Catchmaster Multi-Catch Mouse Trap features smooth inner rims without sharp edges. The traps are available in a variety of finishes and offer discreet color options for specific placements, including sensitive accounts. Customization with your logo is available. Contact your regional Catchmaster sales representative for more information.